Wait, What? Ep. 239: Deathless Brains - Wait, What? ← Wait,What? Best of 2017 Minicast: What Kind of Year Has It Been? The disintegration pit was established as far back as 1971’s Action Comics #402, which gave us Superman vs Supergirl: Feud of the Titans, which really upset me as a kid – Leo Dorman (as Geoff Browne) had Clark and Linda really vicious towards one another. It’s worth seeking out – I think you’ll find the lead feature fun too! 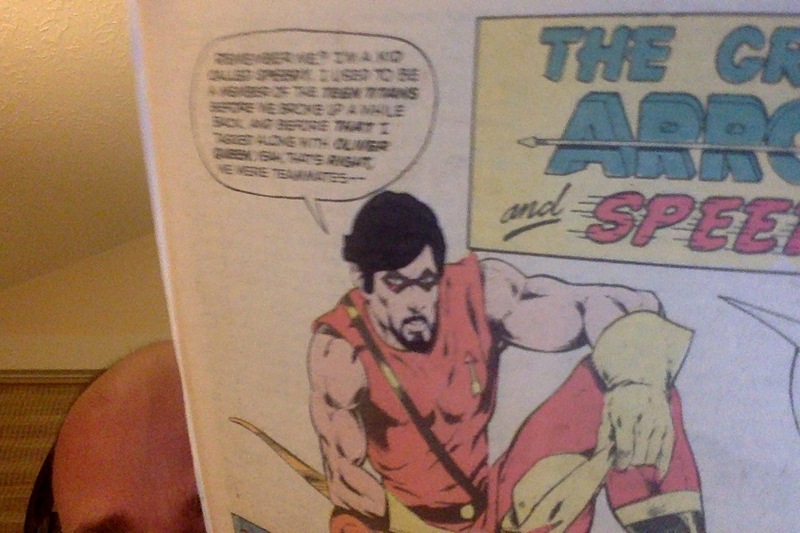 Do we get to see a picture of the fan drawn Speedy facial hair? Yes! Excellent call, thank you!! Hit refresh on your browser—I’ve added the image. Just saw it. Thank you. I give to Patreon to get money to artists, not to credit card processors, so I’m cutting way back, especially on the $1-2 pledges. Some go up, some go away, keeping my total giving around level, but to fewer people. It’s not ideal, but that’s where I am for now. I always got the impression that low donations don’t make a lot of sense, so I give higher amounts to fewer donees instead of spreading the love. In terms of fees, the aggregated system that Patreon was threatening to take away doesn’t penalize small donations. In terms of how much you feel like you are helping? Personal preference, I guess. Spreading the love widely feels better to me, and I’m glad that Patreon decided to keep the current system. Glad daddy and daddy aren’t breaking up our happy podcast home! 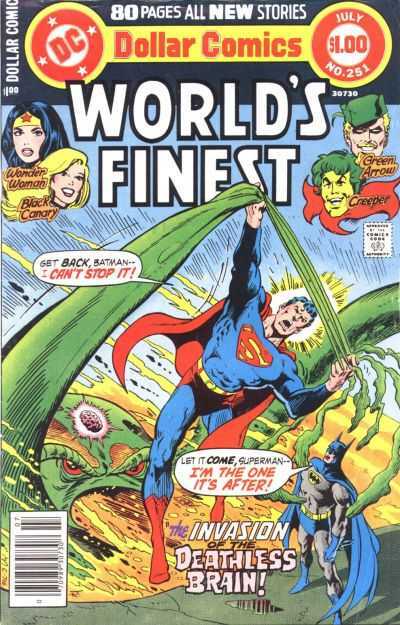 I enjoyed Graeme’s Cliff’s Notes version of the Bob Haney World’s Finest story. It was a nice and unexpected departure from the usual. Maybe you should consider annotating and reviewing similar types of stories/one-shots/miniseries/graphic novels when Baxter Building finally wraps up rather than tackle another long uneven series run? 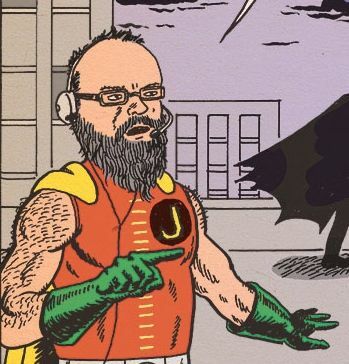 I’m with Jeff on the new Justice League creative team. I was excited at the news Christopher Priest would be writing Justice League but that excitement was quickly dashed when I saw the Pete Ross art. Priest’s Justice League is the Justice League that I want to read about, but this is not the Justice League I want to have to look at. The artist’s layouts are dynamic and the perspectives compelling, but his inks are thick and muddy. Priest’s storytelling needs more realism and less cartoony art. Ugh. The faces. So much of a book’s success is a combination of art and story and they need to compliment each other. This simply doesn’t do that for me. Superman’s childhood friend is now a comics artist? That’s a real comedown from the days when he was a Congressman. I suppose they wanted to protect him from the taint of being associated with politics at them moment. Good thing I didn’t call him Bob Ross. He would have painted happy little trees and such. Seriously, your read of that World’s Finest issue made me laugh out loud on the street like a crazy person too many times. I loved those Dollar Comics! Seems like one of the last Super-Sons stories also featured the disintegration pit as a plot point. Curious if you both have a favorite Bob Haney story, since you mention him a lot. I have two. Teen Titans #16. A trippy dimension hopping story, with really bad 60’s teen slang dialogue and great Nick Cardy art. The other is Brave and Bold #115 which teams a brain dead Batman and the Atom. Great Aparo art complements a crazy Haney story. One of my all time favorite comic stories. I would hope you listened to the wonderful Teen Titan Wasteland Podcast discussing these issues? Had not heard of the podcast but will definitely seek it out. Thanks for the heads up! Sounds like something I would enjoy. I mean, the State of Maryland might have a lair. How would we know? I went back and forth between hearing “Marilyn’s Lair” and “Maryland’s Lair” — hit the 15sec button any number of times. Delightful imagery, either way. That Wonder Woman story was definitely Earth One, hence Poison Ivy, Steve Trevor in dark-haired Steve Howard mode, Di Prince with hair down etc. I’m with Graeme on the Starlord segment in the 2000 AD Christmas special. Totally bonkers in the best way.